If you don't want the kick of the 12 gauge, but still want significant power, the 20 gauge is perfect for you. With a more manageable recoil, you can stay out on the range and bust clays all day long. Winchester has been around since 1866, and their products are high quality and reliable. 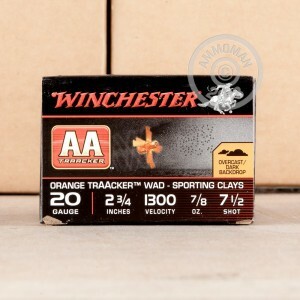 These Winchester Orange TrAAcker Sporting Clay shells are designed to be shot on cloudy and over cast days so the bright orange wad will be visible against the grey sky. Each hull measures 2-3/4" long and carries a 7/8 ounce payload of #7.5 shot. 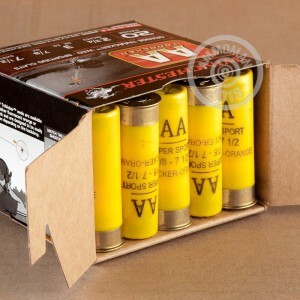 With these Winchester AA shells, you have just the power and pattern you need to shatter clays without a hitch. Stock up and save! At AmmoMan.com all orders over $99 will ship for FREE!